A base is a BZW map object that defines structure very similar to a standard box, but has with the specific properties of being a base for capture the flag style game play modes. In standard CTF games, each team (excluding rogues) will be allocated one or more bases to which they must take an opposing team's flag to to capture. position defines the center of the box in X and Y and the bottom of the box in Z.
rotation defines a rotation around the Z axis for the box, in degrees. size defines the distance from the center to the side of the box in X and Y, and the total height of the box in Z. A Z size of 0 creates a thin base with no thickness or walls. 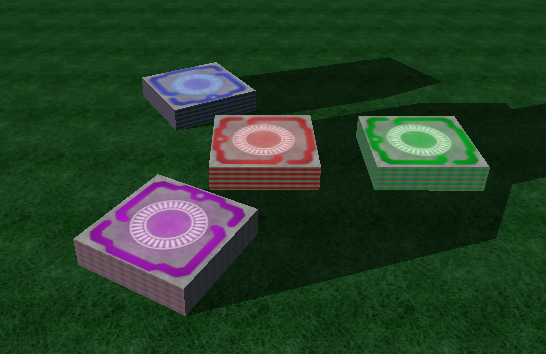 color defines the team to which the base is allocated:- 1: red, 2: green, 3: blue, 4: purple. Because rogue is not a team, there is no such thing as a "rogue base", nor is there a rogue team flag. oncap if specified, indicates that a world weapon with the specified FlagCode is to be automatically generated and fired whenever a flag is captured at this base.ShockWave is a very common FlagCode to use here. Bases do not support the use of Material or Physics Drivers. One will have to supply the -mp and -c server directives for the bases to appear. A team's flag is automatically spawned in the middle of their base when a minimum of one player from two or more teams have connected to a CTF game. The vertical walls of a base a colored striped texture, unlike the standard box. The top and bottom of the base are textured with a colored base logo. The color if the textures corresponds to the team that owns the base, for easy recognition. A base with a Z size of 0 will not have any vertical walls. The base object is supported by all known editors. The base is one of the original objects supported by BZFlag and has been a mainstay of CTF maps since the very beginning. Bases added automatically for random CTF maps by the BZFS server. This page was last modified on 13 March 2017, at 19:00.